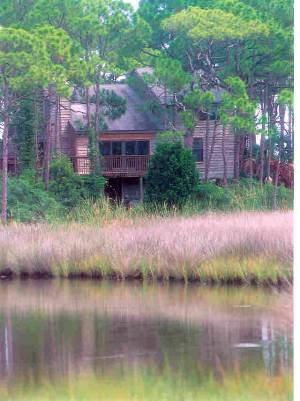 Heron Now is a comfortable bayfront St. George Island Vacation Rental located on beautiful Apalachicola Bay. 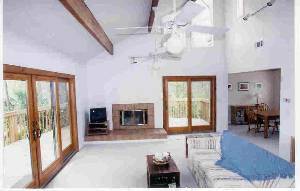 The large deck offers seabreezes and a private panoramic overlook of the bay and estuarine reserve. 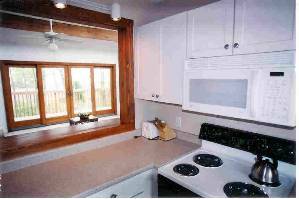 You have the same view from inside the house and even from the updated kitchen. Heron Now has the best of both vacation worlds:the gulf coast beaches and the beautiful bayside marsh. 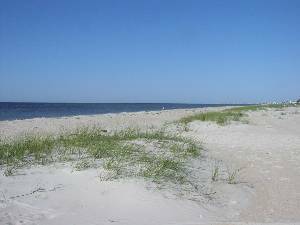 The spacious gulf coast beach is only 1.5 blocks away via easy public access. There you can swim in the waves, fish the surf, or lounge among sand castles. Heron Now adjoins the bayside world of the Apalachicola National Estuarine Reserve which provides one mile of undeveloped bayshore waterfront to explore by foot or boat. Bring your canoes and kayaks(or rent locally) because there is bay access. Bring your fishing gear because the bay is full of sea trout, redfish, and mulllet. Bring your camera and binoculars because every hike or paddle will bring a new discovery. 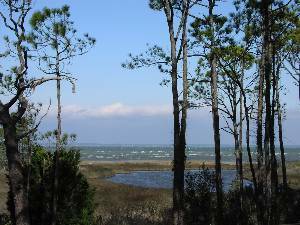 St. George Island is a world class birding, naturalist,and fishing destination.Experience it from the deck of Heron Now, or walk the adjoining reserve or nearby beach, or use Heron Now as base for eco-adventures to nearby natural features such as St George Island State Park, St. Vincent National Wildlife Refuge, and Apalachicola National Forest. the surrounding area are featured in two National Geographic books: Guide to Small Town Escapes and America's Hidden Corners. We could not have picked a better place to spend our honeymoon! We spent our days hiking and riding our bikes. As amateur bird watchers and nature lovers the state park and deck at Heron Now were amazing. We look forward to our next visit to Heron Now. This is our second visit to Heron Now... We had another excellent visit...We are already planning our next adventure to Heron Now. Thank you for sharing this splendid piece of the planet. The birds, the water, the trees-- a sacred place. We've been busy with Christmas preparations since getting back but I didn't want to forget to thank you for our sublime month at Heron Now. Wow! What a special place! My mind goes back often to the scene off the deck of the bayou and the bay. And the air was so clean and easy to breath--I think if we lived there all the time we would all be so much healthier. We're very grateful for that lovely experience of a whole month in that sweet-sweet place. This is a beautiful home with breath-taking views. We could not have had a more incredible vacation. 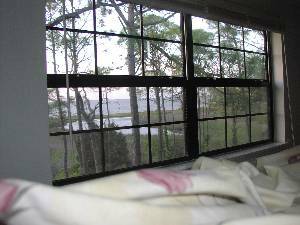 The house is comfortable;the view amazing.We really enjoyed the bay shore, tide pools as well as the gulf beaches. We will come back to Florida in february next year and we would have liked to spend another week on SGI. But we found your house completely booked for this month. We are now looking for another house, but Heron Now was so great that it will not be easy to find an equal one. Thank you so much for this most wonderful of houses, locations, and opportunities for rest, restoration, and adventure! My words can't tell you how much this wonderful week and this house have meant. Thanks for sharing it. This is the second year that we came to Heron Now. We truly love this place. The view is outstanding, but what I appreciate is how quiet it is and how dark it is at night. 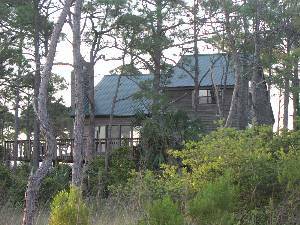 We have been vacationing in the Apalachicola area since 1990. This is considered our second home and upon retirement, it will be. We have stayed in many houses on the island. Heron Now has offered a wonderful view of the Bay and peaceful haven on the island. Deposit: Payment: To confirm your reservation a deposit of 50% will be required within 14 days of placing the reservation. The balance must be paid 30 days prior to your arrival. In the event of a last minute reservation (within 14 days of arrival) your total must be prepaid to confirm your reservation. Each property requires a security deposit. Your security deposit can be held on a major credit card, or if paid in cash, will be refunded at the end of each month. This deposit may be used to cover damages to the property due to the actions of the Tenant, items missing from the property, delinquent rent, late check-out charges, extraordinary cleaning charges, missing keys, pets, etc. This deposit is not a waiver of our right to charge for damages in excess of the amount of the deposit.